Celebrating the Legacy of Earth’s Mightiest Heroes! 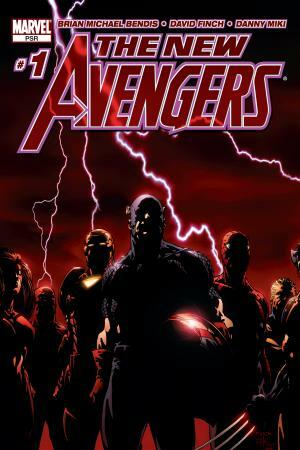 Over 50 years ago, the first Avengers assembled under the guiding principle of strength in numbers. 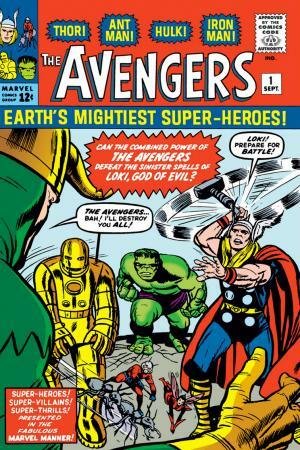 Now we’re breaking down those numbers…with the Avengers’ history in 671 issues! Get all caught up before reading the Avengers and Champions crossover in Avengers #672, brought to you by creators Mark Waid and Jesús Saiz! The meddlesome Loki has framed the Hulk using his Asgardian trickery – good thing Rick Jones and his Teen Brigade suspect foul play! Sending out a distress call to the Fantastic Four, the message is instead picked up by Thor…plus Iron Man, Ant-Man and Wasp! The Avengers are born, (with Wasp to thank for their rousing name). And in #4, Captain America joins up! It’s an assemblage of familiar faces in this reimagined take on Earth’s Mightiest! Captain America, Vision, Scarlet Witch, Hawkeye, Hellcat and Swordsman, awaken a certain Norse Thunder God from an icy slumber. But as Thor is ‘born anew’, his crazed brother Loki is compelled into action – and he’s been spying on this team from the beginning! 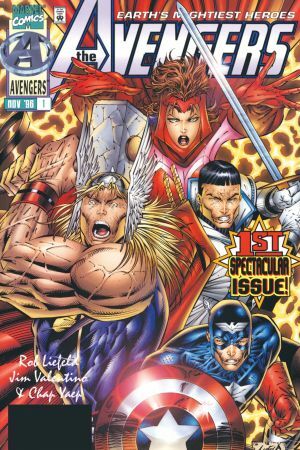 Returned to their own dimension following the Onslaught event (see HEROES REBORN: THE RETURN), the founding team sets up shop in Avengers Mansion. But it isn’t long before their first rallying cry rings out; ALL former members have been attacked by weird, demon-like beasts! An out-of-his-skull Thor returns to Midgard bearing bad news. Looking for a fun numbers game? 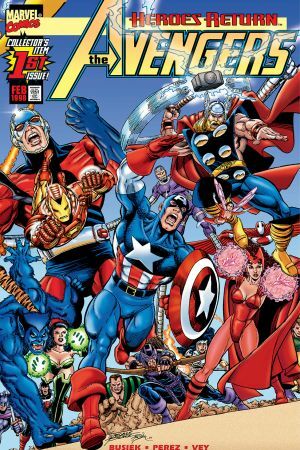 Try to count Avengers past and present on page 17! 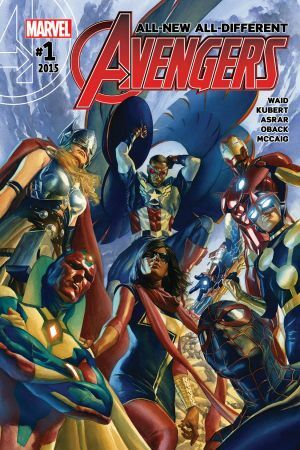 Brian Michael Bendis and an all-star cast of artists reassembles a new team following several key members’ exiles in Avengers Disassembled. There’s been a breakout at The Raft, the superhuman prison home to Marvel’s most homicidal. This threat is so out of hand, Cap calls in Spidey and Wolverine! 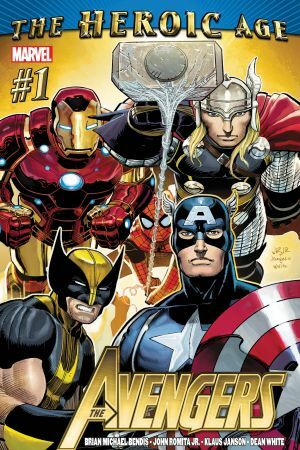 Binge this series in full to see the Avengers go through the paces of Civil War, Secret Invasion, Dark Reign and more! 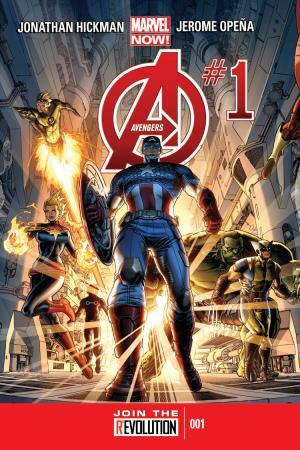 In blockbuster form, the Avengers enter the Heroic Age! Backed by a roster of heavy hitters, this squad stares down the likes of Kang the Conqueror, while even finding a surprise ally in Red Hulk! But once Fear Itself has the team in its clutches, all bets are off. Stay tuned for Avengers Vs. X-Men, where Cap wages war against mutants at the return of the Phoenix! Or read the whole AVX event, available as a Discover! A bold, finite chapter starts here! The brightest minds of the Illuminati couldn’t predict the power vacuum that would be left behind by Earth’s heroes. When the Avengers head to uncharted galaxies to confront the Builders, an ancient race with the ability to destroy us, Thanos and his Black Order begin their incursion of Earth! Read the series that’s a direct prelude to Secret Wars! A new class of heroes are drawn together by fate when a threat much greater than themselves (and from a totally different star system) claims Earth as its playground. 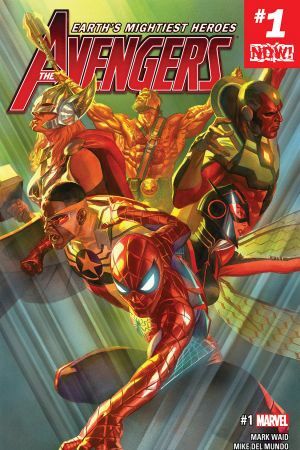 Captain America, Thor, Vision, and Iron Man are joined by a second generation of Avengers: Miles Morales, Ms. Marvel and Nova, all eager to follow their idols’ examples. But who can the kids turn to when the adults start slinging names in Civil War II? As if Kang lurching them through the fabric of space-time itself wasn’t enough, the team of Captain America, Thor, Vision, Wasp, Spider-Man and Hercules must re-weigh the consequences of doing business in the fallout to Civil War II. But there’s little time to reflect – not with Infamous Iron Man, Victor Von Doom, making unreasonable demands…and with Steve Rogers acting like the enemy!